A much better day! Yesterday’s rain has really shown up the colours of the soils, so that we can now see under-dug patches of (9) and (10). The probable pit under (15) is looking really quite definite now, as is the possible posthole. Most people are working on cleaning up the stuff left over from the weekend, while Mervyn & Chris have the short straw of drawing the cobbled farmyard surface, which is the next element to come off the south-western end of the site. On Tuesday, I did some tweaking to the recording system (rearranging elements of the context sheet, for instance) and producing a bulk finds recording form, so that we can begin to record the material that has been processed. I just need to run it past a couple of people to make sure that it records the sort of thing that we need it to. Where Ken is taking away chalk floor (15), the possible posthole has what looks like a medieval rim sherd stuck in the top. It also looks as if it may connect with “Mick’s pit”, which means that the feature is more likely to be a gulley or ditch, which has been lost to the south-west, where trampling by animals and erosion have reduced the level of the farmyard. Further investigation has defined the edge of the pit/gulley, which does not connect with the ‘posthole’. The posthole itself was not a feature, simply a slight hollow in the underlying chalk. Elsewhere on the site, there is a slight hollow appearing underneath (9) beside wall (7), which may be a foundation trench. If so, it suggests that the foundations are not going to be deep; two courses below what is visible would probably take us to the level of the bottom of wall (14), which would be logical, assuming that the foundations were the same depth for both walls. Planning the farmyard is time consuming, but a good training exercise. It’s probably not strictly necessary to do a stone-by-stone drawing of a yard surface of late nineteenth/early twentieth-century date, but it will get people used to the idea of how to do it for occasions when we might have to deal with, say, a medieval surface. I’m beginning to wonder more about the ‘barn floor’ (15), as it’s looking more restricted now than it did originally. It’s not continuing all the way to the door on the north-eastern side and it seems to have coninued only part way over the ditch/gulley. I wonder if it’s the floor of an earlier building on the same site as the post-medieval barn (perhaps contemporary with 125/127 Norton Road to the south). The other problem with regarding it as a floor for the barn is that, now that wall (7) is being removed, the north-eastern foundations are only one course deep, suggesting that there has been considerable truncation of the original ground surface here: everything we are seeing on the site of the barn is below the level of its floor. It is also apparent that the barn may have been older than I originally assumed: the bricks from the post surround containing the doorframe look seventeenth-century in date rather than later, and there is no sign that they have been reused. This could make the barn contemproary with 125/127 Norton Road. In that case, how much older is (15)? 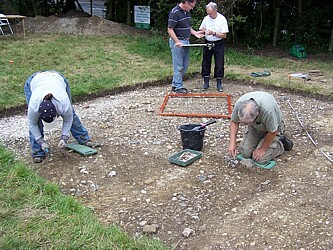 Posted on 16 August 2007, in Fieldwork, Norton Church Field Dig 2007. Bookmark the permalink. Leave a comment.